Wotton in Bloom 2013 are delighted to say that we've done it again! For the fourth year running a small team of volunteers have raised enough money locally to put up over 110 displays in Wotton-under-Edge. 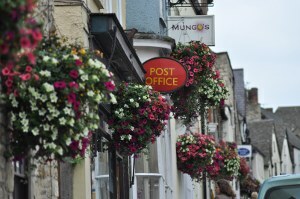 For the fourth year running a small team of volunteers have raised enough money locally to put up over 110 hanging baskets and flower filled troughs in Church Street, Long Street, High Street and Market Street in Wotton-under-Edge. We have also planted the tubs at the War Memorial with flowers to match the main streets. All of the money raised has been raised locally - from the traders on the main streets, local clubs and societies, individual donations, our churches and from local businesses. Our major donors this year are Renishaw plc, Wotton Chamber of Trade and Wotton Town Council. We are still fundraising - because the more we can raise the longer the flowers can stay on display. Our street collection on Saturday 15th June raised £123.22p, and we will be running a fundraising raffle at the Cinema Big Birthday Party on 7th July. WOTTON IN BLOOM 2013 would like to thank everyone who has supported this years flowers, We live in lovely town, and want to enhance it in any way we can. Chair Wotton in Bloom 2013.